Today’s an other quick and easy card for Christmas. 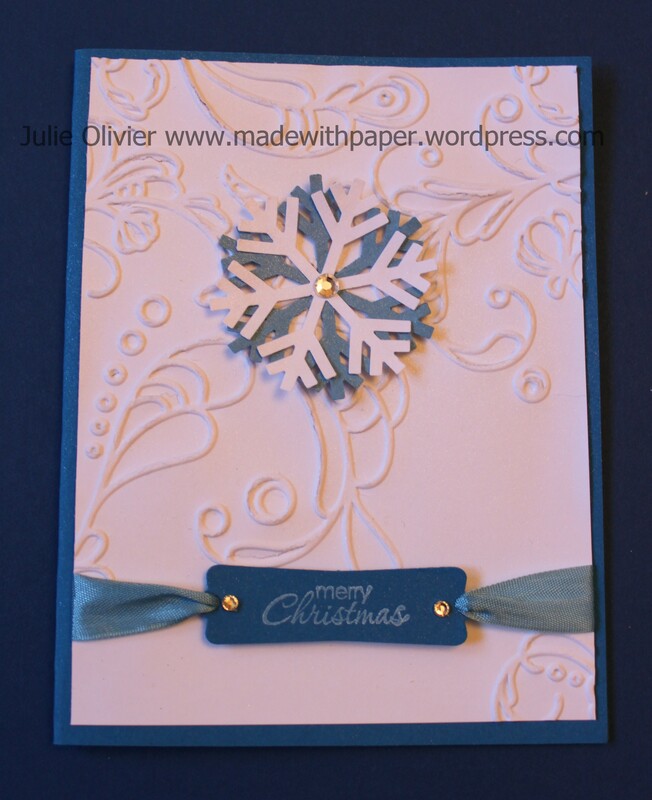 I used the Elegant Lines embossing folder for the background. Then, I sprayed it with shimmer paint mixed in rubbing alcohol. (Use a spray bottle bougth at the Dollar Store, for hair spray for instance. Mix a few drops of shimmer paint with rubbing alcohol. The alcohol helps your paper to dry faster.) That will make your card looks a bit shiny. (I know it’s not so obvious on the picture.) Punch 2 snowflakes and add a rhinestone in the middle. I punched 2 small holes in the “Modern label” to “thread” the seam binding through it and then add 2 small rhinestones.